Beylerbey is an upmarket district of town which owes its name to the sultan's extravagant home on the banks. 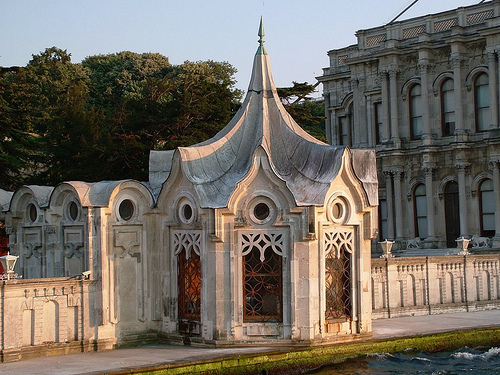 After all, Topkapi and Dolmabahce are not the only palaces in Istanbul worth visiting. The sultans were partial to the fresh breezes hereabouts and the magnificent views over the Bosphorus. 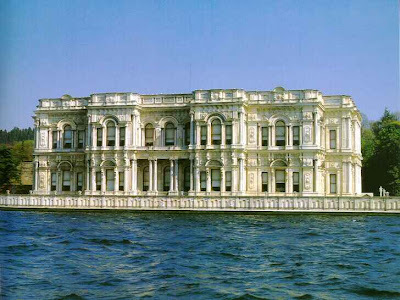 They used to spend the summer at Beylerbeyi Palace, strolling along the gravel paths between white lanterns and neatly-clipped bushes. This place is still a refuge in bustling Istanbul even though the palace now lies in the shadow of a suspension bridge which spans the Bosphorus over a length of 1,074 metres. Traffic roars over it at the lofty height of 64 metres above the water. The sultans liked to take a cup of coffee at one of the little kiosks along the bank. The booths are known as Kusluk which means birdhouse in Turkish. Handsomely-decorated portals front the many jetties and these are a popular backdrop for tourists, newly-married couples and those here on a day's excursion. Sultan Abdulaziz was a giant of a man who ordered the summer palace to be erected here on the site of a palatial wooden construction. The building work took four years, finishing in 1865. The new building had no heating or cooking facilities and meals were delivered from elsewhere. What it lacked in creature comforts however was made up for by a degree of munificence which the last Osmanic sultan was reluctant to forego.